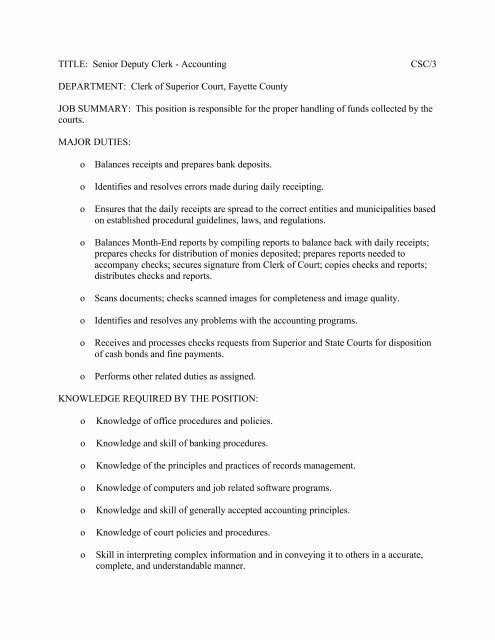 TITLE: Senior Deputy Clerk - Accounting CSC/3 DEPARTMENT: Clerk of Superior Court, Fayette County JOB SUMMARY: This position is responsible for the proper handling of funds collected by the courts. MAJOR DUTIES: o Balances receipts and prepares bank deposits. o Identifies and resolves errors made during daily receipting. o Ensures that the daily receipts are spread to the correct entities and municipalities based on established procedural guidelines, laws, and regulations. o Balances Month-End reports by compiling reports to balance back with daily receipts; prepares checks for distribution of monies deposited; prepares reports needed to accompany checks; secures signature from Clerk of Court; copies checks and reports; distributes checks and reports. o Scans documents; checks scanned images for completeness and image quality. o Identifies and resolves any problems with the accounting programs. o Receives and processes checks requests from Superior and State Courts for disposition of cash bonds and fine payments. o Performs other related duties as assigned.  KNOWLEDGE REQUIRED BY THE POSITION: o Knowledge of office procedures and policies. o Knowledge and skill of banking procedures. o Knowledge of the principles and practices of records management. o Knowledge of computers and job related software programs. o Knowledge and skill of generally accepted accounting principles. o Knowledge of court policies and procedures. o Skill in interpreting complex information and in conveying it to others in a accurate, complete, and understandable manner.